Another year another Zeitgeist Half Marathon. This happened to be a good year for me — as I finally broke into the top 10 and got a course PR. I’ve posted about the Zeitgeist Half Marathon before, so I won’t go into too many details about the race course. Basically, there is a big hill that peaks at ~Mile 3.1. Then there’s a downhill and flat portion followed by another mile long hill that peaks at Mile 8 or so. Then it’s down and flat to the finish, with a few tiny rollers. What makes Zeitgeist great, is that it’s one of the last big races in the Boise area before the winter lull, or at least one of the last ones I typically participate in. (I guess there’s the Turkey Trot and Christmas run, but those are shorter distances.) It’s also well organized. This year I convinced Cyndi to sign up and run it with me. Zeitgeist was the last race she ran before giving birth to our youngest child in May. Cyndi was 3 months pregnant at the time of the race last year. This year she was nervous about getting a babysitter for 4 hours, but I ended up convincing her. It was partly to justify my own 4 hour absence and partly because I thought Cyndi would have a good time and it would give her something to train for. It will also make for some good prep for a marathon I hope to convince her to do next year. Cyndi has a different relationship with running than me. I’m really competitive and enjoy running as a challenge to myself and others. I’m all about tracking my times and distances. I also like the feeling of accomplishment and achieving a goal. Cyndi runs because “it’s the hardest thing I can do,” meaning, it’s an exercise that is challenging and makes her work. She doesn’t use a watch or track her times and distances like I do. I think she also runs because her dad and I rub off on her a bit. The last time she signed up for a marathon was right after she saw me and her dad finish one. She doesn’t get the same thrill out of it as I do, and when she’s done with a marathon she needs some time before she forgets enough that she’s willing to do another. I arranged for my mom to watch all five kids while we ran. It only takes about 20 minutes to get to the starting line from our house, so we left at about 9am and picked up our bibs by 9:30. We were a little uncertain regarding what to wear. It had been cold but warmed up somewhat the day of the race. The Zeitgeist Half Marathon starts at 10am, but it is usually breezy during the second half of the course. I ended up going with a long sleeve shirt. It worked out pretty well, although I would have preferred short sleeves and knit gloves. I was excited for this half marathon. I fully expected a course PR, and hoped I could finish in a decent place. My primary goal was to break 1:30, but I was really hoping to get 1:27 or 1:25 as a stretch. I would be disappointed if I was slower than 1:30:00. In the Idaho Falls Half Marathon I had run a ~1:23 (excluding my detour), but it had some nice downhill and no uphill. In last year’s Zeitgeist race, I got 1:35. After a year of great training and only a couple minor setbacks/injuries, I was ready to improve my time quite a bit. My only issue going into the race was a minor calf strain. I always seem to have little issues like this and it really annoys me. About 2.5 weeks before race day I had done 8×800 intervals on the road. My calf got pretty sore, and it never fully recovered. I was still able to run, but I kept aggravating it every couple days. I realized my predicament and did just a 9 mile run on the Saturday before Zeitgeist (keep in mind that Saturday is my “long” day and I typically run 13+ miles). On Monday I did a very easy recovery run, and given some pain still in my calf, I took it easy the rest of the week and didn’t run any more. I think I did a day or two of cross training in the gym. On race day my calf felt pretty good and I was hopeful. Cyndi and I lined up and wished each other good luck. I lined up pretty close to the start. I saw my running pal Jon and wished him good luck. He was going for sub 1:30 as well, but he was coming off a pretty recent ankle sprain. We did the annual “Zeitgeist” cheer and then the race started. One guy (I later learned his name is Kyle Perry) took off immediately. He ended up setting a course record at 1:13:31. He could easily be a contender to win the Race to Robie Creek next April if he runs it. I took off pretty fast, but mostly under control. I figured I needed to hit 6:30’s on the flat, 7:30’s on the uphills, and 6:00’s on the downhills. My first mile came in at 6:13, so definitely on the fast side. I really need to control myself better in the first mile or two of each race. However, I don’t think I was too out of control. Fifteen seconds off my target pace in a Half Marathon isn’t too bad. I quickly settled in around 7th-9th place since I started in the front of the pack anyways. Zeb Perez, who I had met after the Foothills 50k Frenzy, was ahead of me (which was no surprise). We pushed the first hill pretty hard — my second mile was 6:58 and my third mile was 7:22. I still felt really good and was hoping to keep it going. When I hit the top of the hill I continued pushing hard on the downhill. I didn’t want to relax too much going down and sacrifice time. The downhill pace was right about where I wanted it as my next two miles were 5:50 and 6:03. On the flat portion is where I ran into a little trouble. Coming out of Mile 5 I started to feel a small tightness in my right calf. I knew it was only going to grow and the pain continued to worsen. There’s a small hill during Mile 7, and by the time I came out of that and was about to push up the second big hill, I was worried I might have to walk. Fortunately, my calf and I reached a tenuous truce. It came to a point where it felt like a big knot, but then it stopped worsening. I was doing my best to run on my heels and keep off my toes. By the time I reached the top of the hill, I figured I’d be able to finish the race without a serious injury. Nevertheless, my calf was starting to slow me down. As I made my way down the hill with a couple people close behind, I couldn’t pick up the pace by running on my toes. I was also starting to get sore in my hips and unusual places since I had adjusted my gait to preserve my calf. I was still able to make a pretty good pace. Miles 10 and 11 came in at 6:20 and 6:11, which wasn’t too much slower than my target. I was now shooting for sub 1:29 or at least sub 1:30, realizing that 1:25 was out of reach. The two people behind me, Andrija Barker (the first woman) and Justin Woodward (who I don’t know), ended up passing me somewhere on that downhill. I wasn’t sure what place this put me in, but I was thinking that it was 11th overall. I kept chugging along and watching Justin and Andrija battle for a small victory. I have to admit that I sneaked a peak after one of the turns to see if anyone else was near me. Fortunately no one was, which meant I could be a little lazy. I was still pushing, but my calf was mostly determining my pace at this point. I had more in me but it wasn’t going to happen. After 3 miles of downhill, the final 2 flat and rolling miles of Zeitgeist are always a bit tough. Andrija ended up edging out Justin in the last mile and beat him by 6 seconds. I came in over a minute later. My official time was 1:28:44, which got me 9th place overall. I was pretty happy with that despite that I felt my calf prevented a 100% performance. It beat my time from the previous year by over 6 minutes and finally landed me in the top 10 finishers. I spoke with Jon who came in 19th at 1:33. I also said hi to Zeb and congratulated Andrija, who told me she had beat Justin. She noted that she thought I probably started too fast. I also spoke with my friend Chad, who came in under 1:40. I grabbed some chocolate milk and started jogging back to find Cyndi. My plan had been to jog back to her and then finish with her as I figured that would give me a nice cool down, a few extra miles, and some time running with my lovely wife. I quickly realized that my calf wouldn’t permit any such thing. After limping across the road near the end of the course, I promptly limped back and waited until Cyndi came in. She did pretty well for her first race since having a baby. Her goal was to not walk, even on the steep uphill, and she did it! The wind was picking up, so as we grabbed our post race meal we both got cold. Zeitgeist always has some tasty, unique food for after the half marathon. This year they had sweet potatoes, soup, and apple crisp (if I remember correctly). Not to mention chocolate milk and beer for those who want it (not me). After eating we started walking to the car, which was at a distant parking lot. I was limping along slowly and Cyndi was cold, so she took the keys and ran ahead to get the minivan warmed up. We got one picture on the way out. Notice the smiling faces! I love running the Zeitgeist Half Marathon. It’s always well organized. The course is decent and definitely challenging. The Race to Robie Creek gets a lot more press, but Zeitgeist has it’s own place as a race in the Treasure Valley. I’m hoping to run again next year, although there’s a chance I’ll have a marathon conflict or something. If I do run, I hope to be able to squeeze a few more minutes off my time and see what my body can do. Previous Previous post: Foothills 50K Frenzy (2015) – My First 50K! 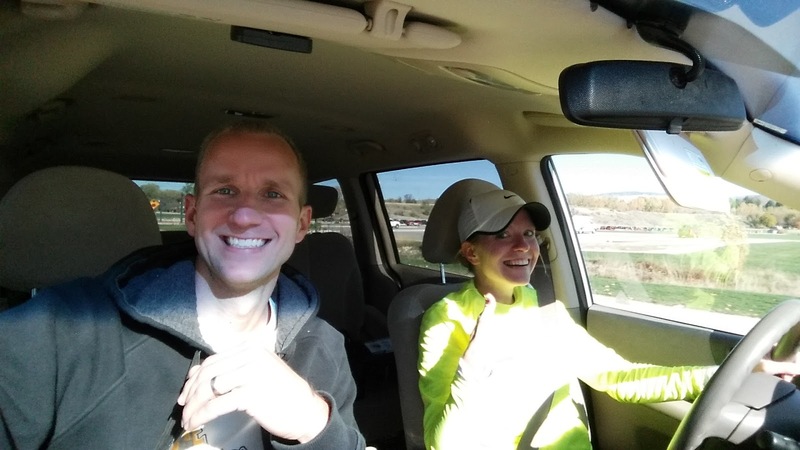 Next Next post: 2015 Clark County Turkey Trot 10k Race Report – New PR!